The appearance of an e-Cat story in the mainstream publication Forbes has been the buzz for e-Cat followers in the past 24-hours. The author of the article, Mark Gibbs, has had the same story or stories similar to this published in a number of publications recently, including Computer World and Network World. The fact that one person has helped publicize the e-Cat across such a wide range of publications is interesting in its own right and serves as an example of how a relatively few influence public perception and the nature of the public debate. But that is a subject for another day and I, for one, am thankful that someone that has a degree of influence in the mainstream media is finally talking about the e-Cat and getting the word out. However, of more interest to me and pertinent to discussions held on this site recently, is a link he included in one of his articles pointing to the website singularity.com. 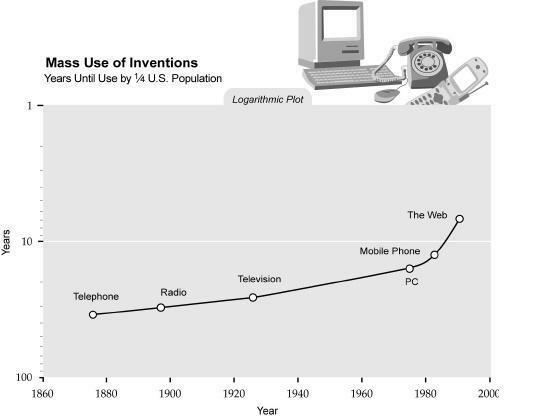 It charts the mass use of inventions over time and shows the increasing speed in which new technology has been accepted and adopted since 1873. As an example, it shows the mass adaption of electricity took 46 years and the mass adaption of the Internet took only 7 years. There has been discussion that the advent of this technology may well usher in a new Renaissance or even a “New Age” of human progress. Gerald Celente, founder of the Trends Research Institute and editor of the Trends Journal, called cold fusion a “game changer” and has likened the advent of cold fusion as “being as big as the discovery of fire or invention of the wheel,” claiming it to be the “the best investment of the 21st Century.” The trend of the chart above certain indicates this as a possibility and many of us follow this story with that hope. The advent of the Internet has changed the nature of society significantly, as has the cell phone, especially smartphones which are a combination of cell phones, the Internet and even to an extent the PC, which in it’s own right has had a transformative effect on society. Yet, one needs to ask if this advent in technology has really made our lives any better. Will the advent of the e-Cat, or another form of cold fusion, or other new energy technology really change the quality of our lives? Does it have the transformative power to change the existing global economic system and eliminate greed, war, pestilence, famine and the dark part of man that seeks to dominate others? Are we putting our hope in the wrong place? I only raise these questions because it seems that many people who follow this story have such a hope and I think that is part of the reason for its addictive nature. Given economic hard times and social unrest, embodied in the “Occupy” movement and the Arab Spring that preceded it, the hope in something that has so much promise and so much hope is natural. Of course, part of the addiction is also the constant drama that has been a part of this story and, let’s face it, a lot of us are addicted to the drama. I think this, the fascination with conflict, speaks again to the darker side of human nature and no technology is going to change that. On the other hand, I would not rule that out entirely. A subtitle to the singularity.com website is “When Humans Transform Biology.” Some believe the Mayan Prophecy of 2012 does not predict an end of the world, simply the end of an age. The Christian tradition teaches of a Great Tribulation (Kondratieff Winter?) and then the dawn of a new age, a New Heaven and a New Earth. Controversial lecturer and conspiracy theorist, David Icke, seems to have an odd combination of a belief in a tribulation of sorts and New Age philosophy, although his spin is a little bit different on it all to say the least. I am sure there are many other examples but I think you get the gist. The thought that we may be on the verge of a societal transformation is spread across different cultures and people with disparate beliefs. Across this array there seems to be both a belief of coming change that may be chaotic and quite disastrous but still with an underlying hope that we will, as a species, be able to push through to a brighter day. The evolving story of the e-Cat and cold fusion is playing out in this context and some of us are attaching our hope that somehow it will at least affect, if not effect, these changes. To what degree it will be able to do either remains to be seen. As the end of October approaches, I am reminded of a cartoon from my youth that is often shown this time of year, the story of the Peanuts character Linus Van Pelt and the Great Pumpkin. “According to Linus, on Halloween night, the Great Pumpkin rises out of the pumpkin patch he deems most “sincere”. He then flies through the air delivering toys to all the good little children in the world. Linus believes that the Great Pumpkin is very sensitive and easily offended and bypass anyone who denies or doubts his existence.” Rossi?. “In writing to the Great Pumpkin, while trying to convince him that one’s pumpkin patch is sincere, one must not to ask for anything specific, but rather wait and accept whatever he brings.” Again, Rossi? Anybody familiar with the story knows that Linus in fact never sees the Great Pumpkin. Yet, every year he awaits its arrival with hope. I think the important part of the story is Linus’ continued hope and not the fact that his expectations are never fulfilled. There is certainly more evidence for cold fusion and the viability of the e-Cat than the mythical Great Pumpkin. But, like Linus, some of us may want to believe, or are at least hopeful, because the e-Cat represents hope and I think that hope is what may ultimately saves and transforms humanity from those things that face us more than any form of technology, although it may certainly play a part to that end. I think that Rossi should just go ahead and paint the shipping container orange, as both a symbol of hope in the vein of the Great Pumpkin….and as a warning to keep a safe distance in case of an untoward event. So as the end of October approaches we will continue to wait and, more importantly, continue to hope. I have posted three videos on the videos page that attempt to explain Frank Znidarsic’s paper “The Control of the Natural Forces,” which offers an explanation for cold fusion as well as the basis for other advanced technology. This entry was posted in Articles, Social/Political and tagged Andrea Rossi, Mark Gibbs e-Cat, Mass Use of Inventions and the e-Cat. Bookmark the permalink. To clarify the above, everybody starts off with fair housing, food, necessities, etc. work from 18 to 45 and retire, no bills, no mortgage, no worries. Have thought of all the objections, but need other people to start looking for the answers and not just find faults. I could go on but point by point I suppose. Have to repeat but I feel that only when all the problems are squarely recognised as money based and a consensus by people to change a system that up to the 1950’s may have been justified, but since then with productivity rising exponentially and the clear result, of more leisure and time to help others having been hidden by Capitalism in a false illusion that everybody must work, purely to keep everybody under control, and allow a certain select few to benefit beyond any fair system. People I think, must recognize that the system in use is not the only possible one and everybody must start to be aware of this and Demand a change to a fairer method. Remove all Money and Finance and start from, reward for effort for Society. Remove all jobs not directly associated with care and production. Excellent essay, that I think it strikes a needed note of caution. Not the kind of naysaying negativism we are all used to, but the fact that this technology must take its place within the ‘real world’ as it stands. That means being subject to the efforts of vested interests to control it and delay its widespread integration long enough to protect their existing investments. Given the extent of their ‘influence’ on Western governments, these efforts will certainly be successful. Fortunately this process of integration may not require too long – perhaps just a decade or so. Most of the world’s nuclear power stations are approaching the end of their lives, and I’m sure the industry can find some way of passing the costs of decommissioning them and storing the waste forever to the taxpayer, allowing them to withdraw without losses. Most other types of power station can be ‘retro-fitted’ with cold fusion heaters, and Rossi already seems to be concentrating heavily on this market. While ‘Rossi boilers’ may be suited to installation in larger ships, most other forms of transport will probably continue to burn liquid fuels for some time, so even the oil industry will be able to move away from natural oil in a controlled fashion. Ways will be found to use Ni-H energy to create synthetic liquid fuels from cheap or free feedstocks such as atmospheric CO2, and the oil companies will certainly not waste any time moving into this new sector. Even crude oil will still have value as a feedstock for the plastics industry (among others) for a long time to come, although the barrel price will have to take a massive dive over time. But anyone who expects cheaper energy prices to result from this transformation is likely to be sorely disappointed. It is unlikely in the extreme that domestic boilers using LENR cores will be permitted in the near future, and if they ever are, taxes will be imposed that force the cost of running them into the same league as gas or electricity. It seems likely that the technology may be adopted for central power generation – but no significant reduction in power costs is likely to result from this. Governments and the media (same thing, really) have spent a great deal of time and effort conditioning us into accepting that manmade CO2 is wrecking Earth’s climate, and that we must pay a heavy price to ‘save the planet’. The fact that a year’s worth of volcanic eruptions will release more CO2 into the atmosphere than man has in his entire history, is not something we hear about very often. Soon it will be time to collect the return on all this investment. Ni-H is simply the perfect vehicle for exploiting this completely fake threat as never before – its cheap to build, cheap to run, can be easily retrofitted in existing plant, and it can be made to seem just dangerous enough so that it can be completely kept under the control of the ‘right’ people. With a bit of spin from the media, the very people who are currently seen as the cause of the ‘problem’, Exxon, Mobil, EDF, Nation Oil Corp, BP, Areva and the rest, will soon be seen to be leading the charge toward a green and better environment – hurrah! The Power of the internet means that today people know things that in the past where successfully hidden, it will only get stronger as the wall st. protests show. Authority, that is the rich and powerful will find it harder and harder to control people. Everyone of us now has a say, use it well. I agree that the level of communication that the Internet allows in the course of human history is unprecedented. More than any other communication medium, I do think it has the potential to raise the level of human conscientious by the depth and breadth of discussion and exchange of ideas is allows. But it is a frail medium and it would not much to take it down. so one would be unwise to take it for granted. There is already talk in the US of an Internet “kill switch” that the president can use in times of an “emergency.” In fact such a mechanism has already been enacted and attempts are underway to “corporatize” the Internet. China already heavily sensors the Internet, as do many repressive regimes. This medium scares the entrenched elite, as it well should. I think the Internet is an extension of freedom of speech and all advocates of democracy should insist on protecting it as a medium of such. Yes, that prospect scares the whatsit out of me. If the elite can create a ‘situation’ that allows them to assume control of the internet, all of our ‘springs’ will come to an immediate end. I just that some geeks somewhere are working on ways to circumvent this. edit function – pretty please! I hear you Pete. I’ve been working on it. The only way to get an edit function on the site is going to cost additional fees and I cannot justify that right now. However, I do see the need and I would like to provide that convenience to everyone. I will continue to explore the available options. I thank you and everyone else for their patience. This site is hosted by wordpress.com.and the plugins only work with wordpress.org. I do thank you for the suggestion though.